Flappadiddle Doo is another crazy platformer from the obscure mind of AGameAWeek. The task is easy. 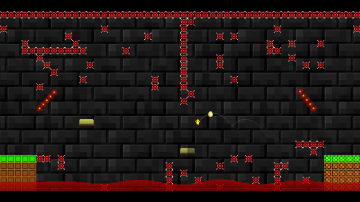 Flap your way through each screen-sized level, hopping onto the five lit-up platforms, and then continuing on to the next screen. Along the way, you'll have to avoid dangerous obstacles, gather up eggs, rescue your birdie friends, and as always .. Spike.. Dislike!! Secret Hidden Functionality : Head into the options menu and "Enter Your Name" to enable the online scoreboards! ooooh!!! You can Download Flappadiddle-Doo here. It should (*should*) work on Windows, Linux and MacOS. In addition, if you've got a hacked Homebrew-Capable 3DS, you might also like the version that's available for that, too.